In medium bowl, combine taco seasoning mix, brown sugar, 1/2 cup oil and vinegar; mix well. Place chicken in shallow medium bowl. Pour 1/2 cup seasoning mixture over chicken. Reserve remaining mixture for dressing. Heat 1 to 2 tablespoons oil in medium nonstick skillet over medium-high heat until hot. With slotted spoon, remove chicken from seasoning mixture; discard remaining seasoning mixture. Add chicken to skillet; cook and stir 5 minutes or until no longer pink in center. In large bowl, combine mixed greens, tomatoes and onion. Add reserved seasoning mixture; toss to coat. Arrange salad mixture on serving platter. 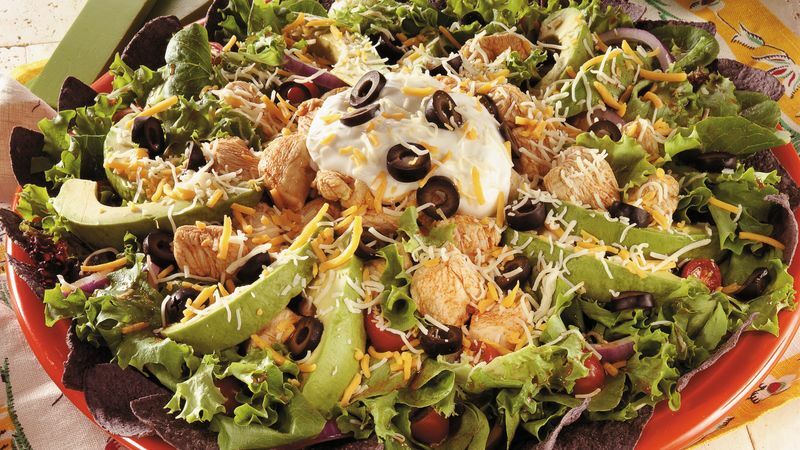 Top with chicken, cheese, sour cream, avocado and olives. Arrange tortilla chips around salad.